Regardless of the reason behind Brando’s lack of availability, the lack of Brando has an enormously positive effect on the impact of The Godfather Part II. Part II is rather unlike any other film that has ever been made, since its narrative weaves around the ghost of an actor that never even appears in the film itself. (Do the math: the only movies that allow for this possibility are sequels, which are a tiny percentage of all the films that have been made. Not to mention most of them are shallow cash-ins by movie studios that have no artistic merit at all and never attempt anything of this magnitude, cinematically.) 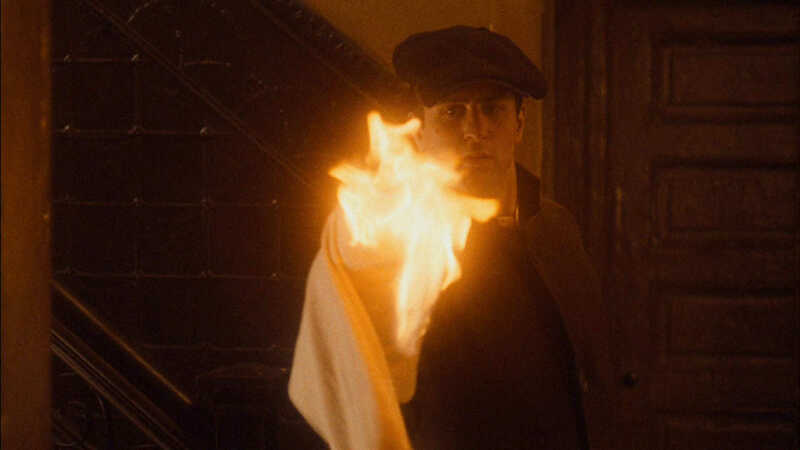 What most people think is unique about The Godfather Part II — namely, the parallel narrative structure depicting the rise of Vito’s empire and the fall of Michael’s — isn’t really all that unique anymore, though it certainly was new and unexpected at the time. (The structure more or less formed the basis of the TV show Lost.) No, it’s Brando’s lingering presence that makes this movie so special; it’s a movie about Don Corleone, and neither central character offered in the film’s parallel narrative quite measures up to weight of Brando’s portrayal as the character. Obviously, the young Vito comes much closer than Michael does, but there’s still a big difference between seeing Vito wheel and deal in his twenties and watching him completely demolish Bonasera at the negotiating table in the opening of Part I when he’s in his fifties. He assassinates Don Fanucci (Gastone Moschin), yes, but he does so because he threatens his family; he’s content to co-exist with Fanucci imposing his protection racket on the entire neighborhood before that. Likewise, when he finally gets his revenge on Don Ciccio (Giuseppe Sillato) in Sicily, who murders Vito’s parents and brother in the opening minutes of the film, it’s because of what he did to his family; it’s an act driven by years of resentment at having been smuggled from his homeland to America, traveling completely by himself, without anyone familiar to him where he was headed and where he was coming from. Your mother’s dead. Before long, I’ll be dead. And you. And your brother. And your sister. And all of her children. All of us dead; all of us rotting in the ground. It’s the family name that lives on. It’s all that lives on. Not your personal glory, not your honor, but family. 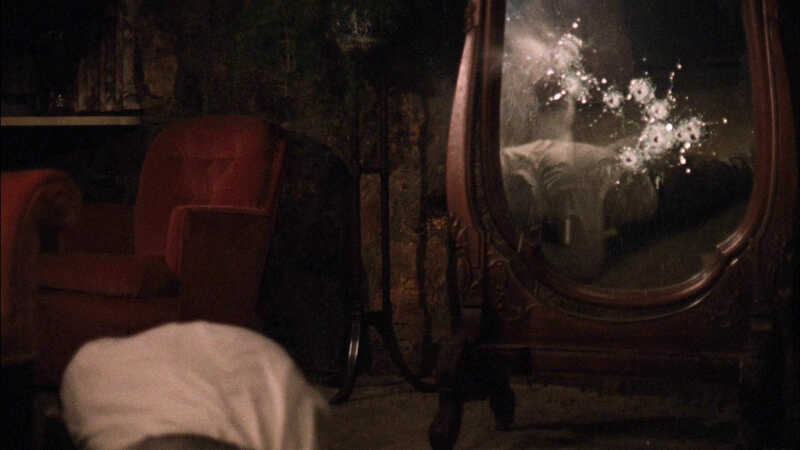 One of the reasons why The Godfather Part III was such an unnecessary film is that the post-intermission hour of The Godfather Part II is really a movie unto itself. The major plot of Michael’s story in Part II is concerned with Hyman Roth (Lee Strasberg), and likewise Vito’s antagonist is Don Fanucci. Both of these threads more or less wrap up by the intermission two hours in, which occurs right after Fanucci’s assassination. The final 70 minutes or so is almost a separate film, much like how the first 27 minutes of Part I is almost a separate short film. Everyone always says The Godfather Part II is really two movies in one, but it’s actually not in the way they think. 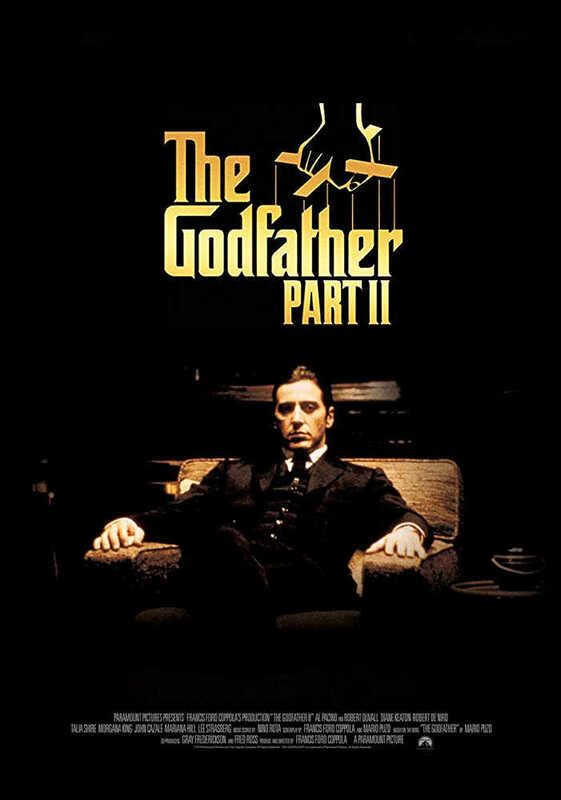 No, it’s not because there are two parallel narratives, it’s because there is an extended epilogue that presents the thorough unraveling of the Corleone family in great detail — the final 70 minutes of The Godfather Part II is the real The Godfather Part III. I hadn’t seen either Godfather film in a while before sitting down for these two write-ups, but I always remembered Part II being particularly grim. Which is why I was surprised that it isn’t — until the intermission, that is. While I wouldn’t characterize the plot with Hyman Roth to be ordinary since it’s executed well, it’s a typical narrative plot — Roth is the antagonist for Michael, who is our protagonist, of course, even if he is an antihero. 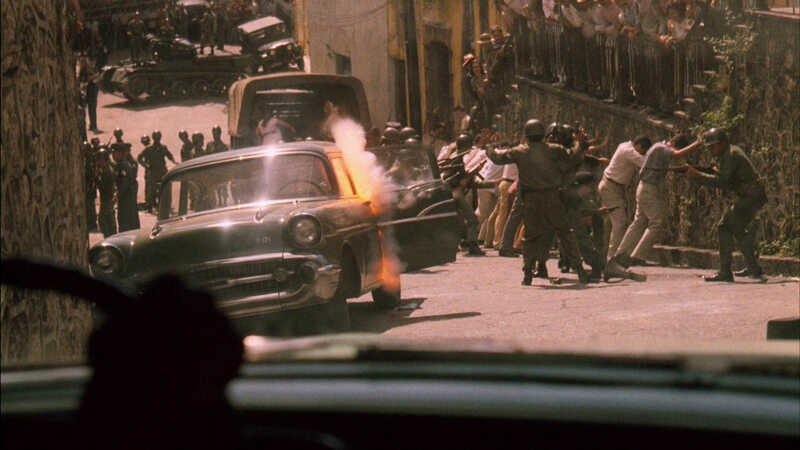 By the time Michael escapes the revolution in Cuba shortly before the intermission, Roth’s role in the story is more or less finished — he disappears for well over an hour, surfacing again just to die in the flurry of killings that closes the film. Though far from cheerful, none of the events with Roth are especially grim, either, which is why it’s such a shock to experience the movie as it descends into its monstrously bleak final 70 minutes. 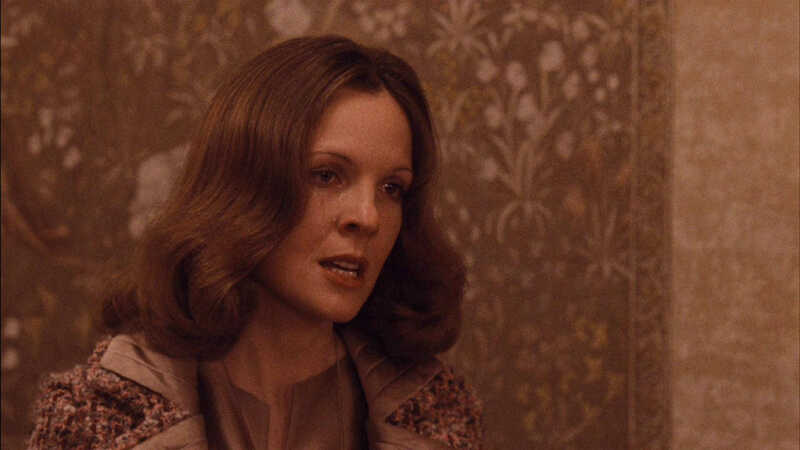 In a memorable scene that may be the most painful to watch in the history of film, Kay announces she’s leaving Michael, and when he unsuccessfully attempts to reason her out of it, she finally admits that she didn’t lose the child as a result of a miscarriage; she had an abortion. It’s a stunning admission, and is one that’s impossible to see coming, since we have been so busy following Michael’s war with Roth and his testimony in front of the Senate committee that we don’t have much time to think about Kay. She stops there because Michael then attacks her with an enormous amount of pent-up rage. It’s a staggeringly powerful scene, and not just because we have been with these two characters for nearly six hours of screen time. No, it’s what this scene represents that makes it haunting as hell. Is Michael and Kay’s marriage now in shambles? Yes. But the dissolution of their relationship represents a true crumbling of what the Corleone empire is supposed to stand for; the foundation of family — “all that lives on,” in the words of the immortal Tywin Lannister — is now gone. All that’s left is a labyrinthine mess of criminal connections. But moreover, Michael’s motivations have reversed: while in the first film he developed the ability to let the ends justify the means, The Godfather Part II is a lesson in what happens if you flip the script on Machiavelli’s famous line from The Prince. Fredo, you’re nothing to me now. You’re not a brother, you’re not a friend. I don’t want to know you or what you do. I don’t want to see you at the hotels. I don’t want you near my house. When you see our mother, I want to know a day in advance so I won’t be there. You understand? The Godfather‘s ending was sinister, no doubt, but the film ended on a somewhat hopeful note, since the promise of a new era for the Corleone crime syndicate was just so damn exciting. Plus, the folks who perished in the first film’s barrage of deaths during the climax (yeah, both movies do that) were either sworn enemies who were criminals themselves or, like Tessio and Carlo, had committed the biggest sin of all in the film’s universe: disloyalty. Michael’s consolidation of power is thrilling to watch: we look past the fact that dead bodies litter the screen because those characters knew the game they were playing — no one forced them into mafia life. And that same sentiment applies to Michael, as well, since he began the first film with his back turned to the field of play, and willingly took a larger and larger role in the Corleone family business as the film progressed. 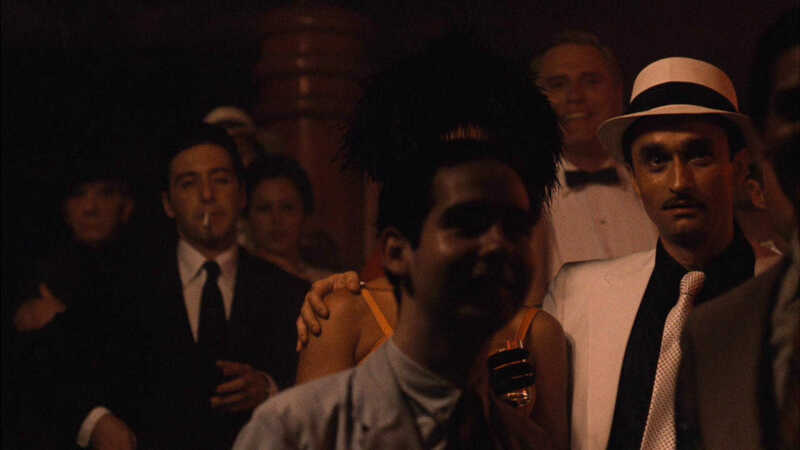 By the start of The Godfather Part II, though, Michael has no goodwill left with the audience — he revealed who he ultimately is at the end of the first film, effectively cashing in all the currency of benevolence he displayed during the first two-thirds of Part I. To some extent, the filmmakers must have felt some kind of responsibility to make sure the Corleones got their comeuppance, at least in the sense that they were not given a happy ending. (There was apparently some backlash against the first film for romanticizing mafia life.) 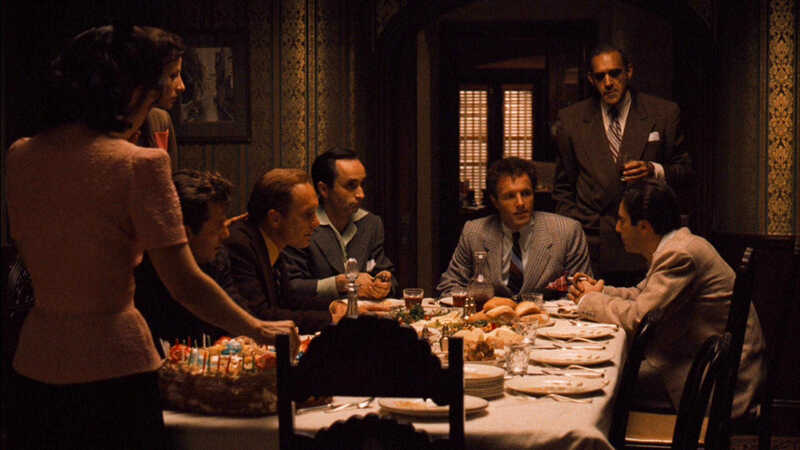 The Corleone family is more powerful than ever at the end of Part II, yes, but when it comes to the currency of family, Michael is bankrupt, and we know he’ll be alone for the rest of his life — such is the price of absolute power. When we flash back to the dinner table scene on the day the Japanese bombed Pearl Harbor, we’re reminded of just how different Michael is at the end of the proceedings in Part II than he was when we first met him at the wedding reception in Part I. Sonny tells him, “Your country ain’t your blood. You remember that.” Yet Michael disagrees, informing everyone at the table that he has enlisted in the Marines. Everyone is understandably shocked, and the only sibling that supports Michael’s decision is Fredo…whom we have just watched Michael murder years later. As with The Godfather, The Godfather Part II scored three Best Supporting Actor nominations — and there weren’t even any repeats. While the first film resulted in nominations for James Caan (Sonny), Robert Duvall (Tom), and Al Pacino (Michael), the second film saw Robert De Niro (Vito), Michael Vincente Gazzo (Frank Pentangeli), and Lee Strasberg (Hyman Roth) receive nominations; De Niro was the only winner of the six. Getting Gazzo and Strasberg to even act in the film was an enormous coup on the part of the filmmakers: Strasberg makes his film debut as Roth, and Gazzo makes his second appearance since debuting in On the Waterfront twenty years earlier. If you have researched/studied film or especially acting before, the name Strasberg will probably be familiar to you, since he developed method acting as we know it and ran the hugely influential Actors Studio, whose pupils included all three Don Corleones. Yep, Robert De Niro, Al Pacino, and Marlon Brando are all method actors — when acting in a film or play, they become the character 24/7, even when the cameras aren’t rolling and the lights are off. So if Hyman Roth seems like a crafty character, that’s because he’s literally being played by the master himself, Lee Strasberg. And the fact that Strasberg is making his film debut here lends the character even more weight. After the events that close Part I, Michael more or less has absolute power in New York, which certainly must have posed a challenge for Francis Ford Coppola and Mario Puzo when it came to penning a sequel. Who would stand in his way now? What kind of character could have the gravity to match the new Don Corleone? That they came up with this as a solution is pretty genius, even if the vast majority of those who watch the film have no idea why. 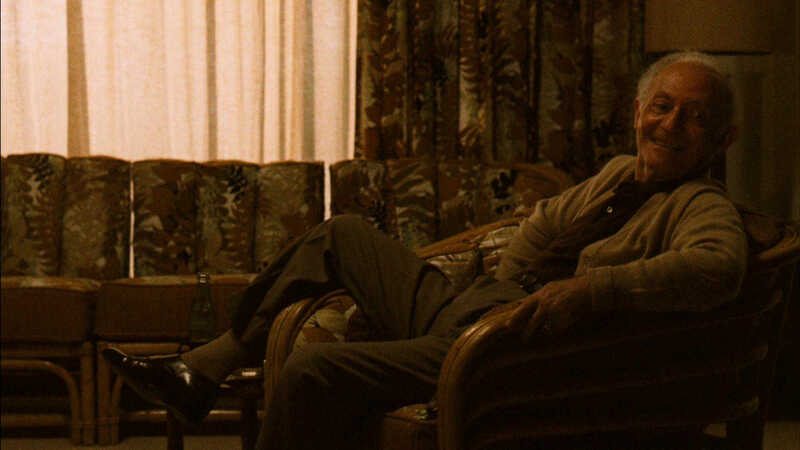 Most people probably think of the Hyman Roth character as just some old Jewish guy who Michael is battling with for some reason, but if you watch the scenes with a newly refocused lens, you’ll notice that Roth is continuously exploiting a mentor-student approach to their relationship — one that extends beyond what ends up on screen. We can sense that Michael knows better than to listen to anything Roth has to say, but does so anyway because they have some kind of history together that we aren’t privy to. (And a business deal, as it turns out.) The best way to describe Roth is that he’s Yoda on the outside and Vader on the inside — and considering director Francis Ford Coppola‘s fraternity brother-like friendship with George Lucas, it may not be a stretch to say that the Michael Corleone/Hyman Roth relationship influenced the Star Wars universe just a little upon its formation a few years later. And just like in the Star Wars trilogy, where Yoda — the wisest Jedi master of them all — doesn’t turn up until the second film, Roth’s masterly presence doesn’t make itself known until the second Godfather film (though we learn via dialogue throughout Part II that Roth has had business dealings with the Corleones for years). As villains go, they don’t get much better — particularly since Michael is an antihero to begin with and therefore needs a complex antagonist in order for the story to be dramatically satisfying. Roth is clearly a “bad guy” (to use a highly technical term), but he is never someone we actively hate. We don’t see him (directly) kill anyone or even do things that are illegal, though it’s suggested that he’s ordering hits on people, of course. 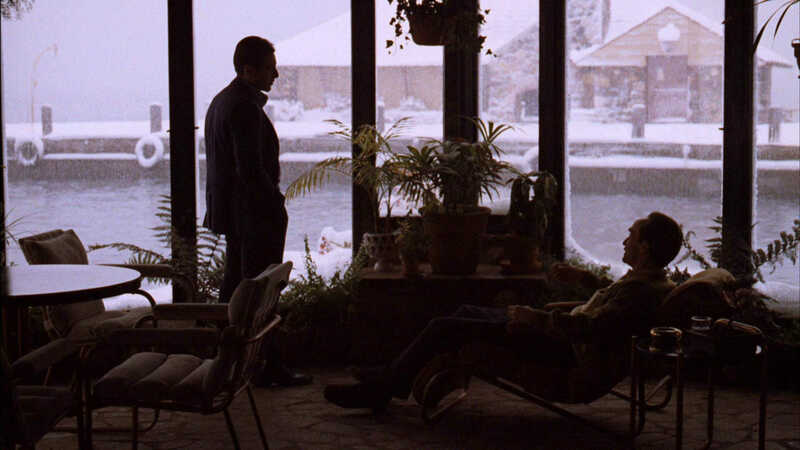 When Michael engages with Roth, the only thing that matters to him is loyalty; this is what the plot with Roth boils down to, scene after scene. This, of course, was the hallmark of the first film: that in the world of organized crime, the biggest crime of all is disloyalty. 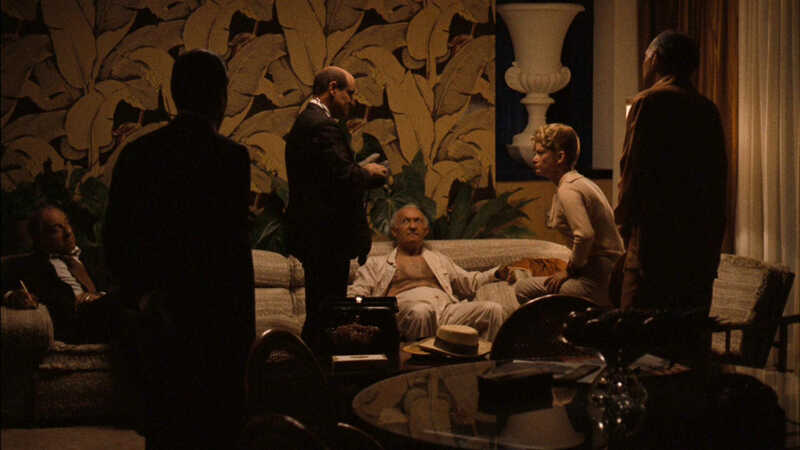 And Michael constantly suspects he is being undermined by Roth at every turn throughout the business deal in Cuba — the specifics of which are never made entirely clear, though Roth says it will “make history” — that eventually falls apart just shy of the intermission because of the Communist revolution that occurs there. (The deal was dependent on the old government’s full cooperation with whatever it was Michael and Roth wanted.) But Michael never calls off the deal — at this point, he is too consumed with chasing the rabbit down the hole. He would rather risk being wrong about Roth than risk missing out on a history-making business deal. The formative Corleone scenes with Vito are not as weighty as Michael’s narrative, but they are consistently thoughtful and provide a necessary contrast to the gloomy outlook of Michael’s half. (It’s also important to have a significant bulk of the movie take place in New York, as well, now that the Corleones have moved to Nevada.) Not to mention they are pivotal in putting the scenes in which Michael eventually strays from his father’s path in perspective, since we witness Vito’s rise to power along with Michael’s fall from respectability. Vito’s chapters showcase a more innocent American dream. Not in the sense that Vito isn’t a criminal — he does assassinate Don Fanucci, after all — but more in the way that there are no expectations for how Americans (and particularly immigrants) are supposed to turn out in life. 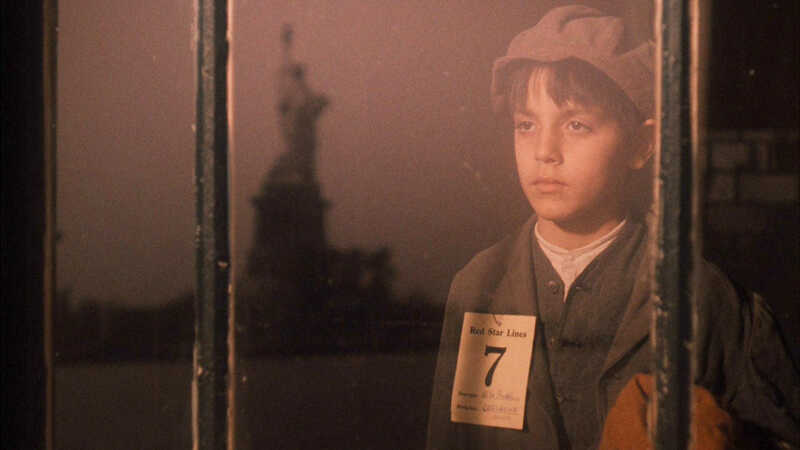 When immigrants came to America through Ellis Island around the turn of the century, as Vito does in the film, they were promised nothing — at this point in American history, there were no public schools or entitlement programs such as Medicare or Social Security. America was such a different place in the 19th century than it was in the 20th. Anybody could come and live here, and while it was possible to strike it rich, just coming here from wherever they came from made immigrants usually feel rich enough. For so many immigrants, the first message they received was engraved on the Statue of Liberty as they sailed past it in New York harbor, as Vito does: “Give me your tired, your poor, your huddled masses yearning to breathe free.” It always strikes me how deep the sense of promise is for Vito throughout the scenes in Little Italy, when, of course, he’s been promised nothing, and by no one. Such was the relationship between the immigrant and his new home: Vito’s been given a fresh start, a chance to make his own way on his own terms. Today, pretty much every American takes this defining principle of our country for granted, at least to some degree; we all feel like we’re promised success. So deeply embedded are our artificially constructed institutions (e.g., education) in the fibers our culture now that we’re taught to think that if we succeed at school, we’ll succeed at life, or at business, or at whatever it is we hope to succeed. But both The Godfather and The Godfather Part II are astonishing masterpieces worth experiencing again and again. (Both Blu-ray releases are highly recommended.) It’s so incredibly rare for films to achieve such a literary depth in terms of character and story. Part II did even better than its predecessor at the Oscars, winning both Picture and Director, as well as Adapted Screenplay, Supporting Actor, Score and Production Design. Whereas Nino Rota‘s score never felt like it extended much beyond basic themes in the first film, his work feels much more full-bodied throughout Part II, and the score is one of the reasons why the film is so haunting. 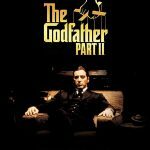 But it’s mostly that soul-crushing final 70 minutes that makes The Godfather Part II what it is: a modern-day parable about the perils of chasing the American Dream, about what it’s like to end up with everything and nothing at the same time, and about what happens to those around him when the king becomes the throne.